Friv-o-lous [friv-uh-luh-s] adj: characterized by lack of seriousness. Food-ie [foo-dee] noun, slang: a person keenly interested in food, esp. in eating or cooking. One more note on the supposedly wondrous Houdini. While at our favorite place on the lake this past weekend, the hubby purchased some imported beer to accompany the killer burgers we had grilled and guess, just guess, what tool he used to open said refreshment? That’s right, the wine key! Yet another reason the wine key beats out the Houdini – it’s multi-functional! I used to bartend. Not sure I have shared that yet but yes, for about 4 years, I was slinging drinks at one of the newest establishments in town. This was no “Cheers” kind of bar, mind you, we’re talking a bar that has come right out of Cocktail. Part of the training had us flipping bottles and chucking full 22 oz. beers through the air at each other. Even Tom Cruise would have been impressed. They were some good times. Having fun while making money – how could they not be good times? Of course, the bartending gig could only run its course for so long and for me, it ended upon graduation from college. But during the ‘ole bartending days, I became well acquainted with certain “tools of the trade,” in addition to a hefty arsenal of coveted drink recipes (if you’re lucky, I’ll share some with you eventually). One of tools that I still use today is the basic wine key. I still remember the first day I learned how to use it and how amazed I was at how simple it became to open a bottle. 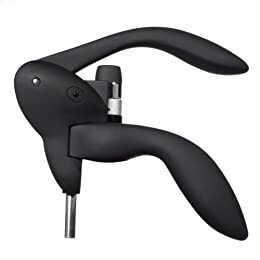 I was used to fussing with those openers that you have to screw all the way down and then pull the arms up while praying the cork doesn’t just come halfway out or, worse, break in half. I was excited to not engage in a fight between bottle, cork and opener and over the years, I shaved more and more time off of opening a bottle of wine utilizing my dear, dear wine key. Now that I have explained the deep relationship I have with my wine key, you could imagine my surprise when recently confronted by a certain Houdini character that I had heard nothing about. I was doing a cousin of mine a favor by bartending his rehearsal dinner (very sore feet, by the way, I had forgotten how hard it was) and assumed the establishment would have a wine key. When asked by myself for a wine key, the woman who had been running around frantically handed me this contraption called a Houdini. It became very apparent very quickly that I had no idea how to work this fancy piece of, um, plastic?? Awkwardly maneuvering the large object in my hands, a cousin notices my little issue and loudly says, “You don’t know how to use a Houdini? !” First of all, I am not an attention-lover so I really didn’t care to have about 10 people turn and stare at me. Second of all, I did not like the emphasis put on the you part of that statement. I was puzzled for a moment. Does she mean you as in, the one who always has a glass of wine in her hand? Naaaaah. She means you, the one who used to be a bartender. Yes, that’s it. I was feeling a little better once I realized she wasn’t calling into question the frequency of my wine consumption but was not feeling all that much better because I then noticed that she was dissing my wine key! After about 3 attempts, she showed me how to open the bottle and discharge the cork from the amazing (please) Houdini. I managed to use it the rest of the evening without much trouble and I was grateful for that. But really, who needs that piece of equipment? It is huge and would take up a lot of space in my tiny wine cabinet drawer. It reminded me of the silly things that I have seen for the kitchen in the past. Things like toast tongs. When I saw the hefty price of 31.49 at Target that made it even sillier to me. In an economic state where minimalism is the buzz-word and just about everyone is checking and re-checking their bottom line, the Houdini seems to be a splurge not worthy of splurging on. Perhaps I am over-reacting to this Houdini simply because I am a fan of nostalgia. Maybe the people who love their Houdinis will think that I am old school or not a true “wine enthusiast,” (which I’m not) and that doesn’t bother me a bit. I’d rather spend that $31.49 splurging on my favorite bottle of wine that I can open with my trusty, rusty, old, reliable, fits-in-your-back-pocket for a picnic wine key. I’m a Blissfully Domestic Contributor!